The latest Adam Sandler comedy has been dated for Blu-ray in March. 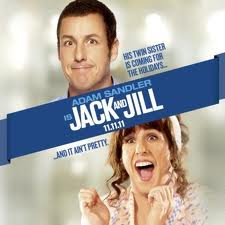 In an early announcement to retailers, Sony has slated Dennis Dugan's 'Jack and Jill' for Blu-ray on March 6. Family guy Jack Sadelstein (Adam Sandler) prepares for the annual event he dreads: the Thanksgiving visit of his twin sister, the needy and passive-aggressive Jill (Adam Sandler), who then refuses to leave. For the movie's whopping $79,000,000 budget, it bought itself a 2.9 rating on IMDb.com. Specs have yet to be revealed for the Blu-ray/DVD/Ultraviolet Digital Copy combo pack, but supplements will include four featurettes: Here Comes Jill, Laughing is Contagious, Look Who Stopped By, and Boys Will Be Girls. Blu-ray exclusives include: Stomach Ache and Don't Call It a Boat-Royal Caribbean. You can find the latest specs for 'Jack and Jill' linked from our Blu-ray Release Schedule, where it's indexed under March 6.